This year I am growing lettuce under a floating row cover. A floating row cover is a very light fiber fabric. I buy mine from Gardens Alive!. I have been using garden's alive products for a very long time. I recommend them. Enter floating row cover in the search box and you will find two. Mine are not the heavy weight, just the regular. Okay, now you know what a floating row cover is. Apply the cover either when you plant the seeds or as soon as they sprout. The goal is to protect the plants before the bugs find them. 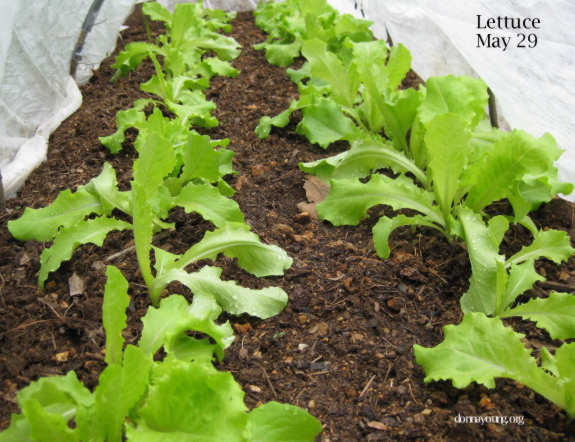 I covered the lettuce after planting the seeds. I used branches for support hoops, but that is not good, branches are rough and will tear the cover. If you use branches, cover them with something (such as duct tape). The cover doesn't really need to be supported. It is lightweight enough that is rises with the plants as they grow. I just like supporting the cover. I think it looks nice. This is an image of the floating row cover. I bury the edges in a trench. When I need to weed, I carefully free the edges and lay back at least half of the cover. Another benefit of the cover is less weeds. Apparently quite a bit of the weeds that germinate in the garden are from air borne seeds and the cover blocks them. I should say that this plot was double dug and amended quite well with compost and that could be another factor in this bed having fewer weeds than the rest of my garden. 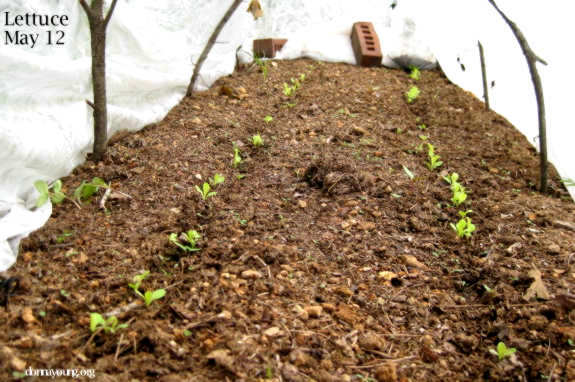 Here are the pictures of the lettuce plants under the cover. This lettuce bed was planted on May 1st. 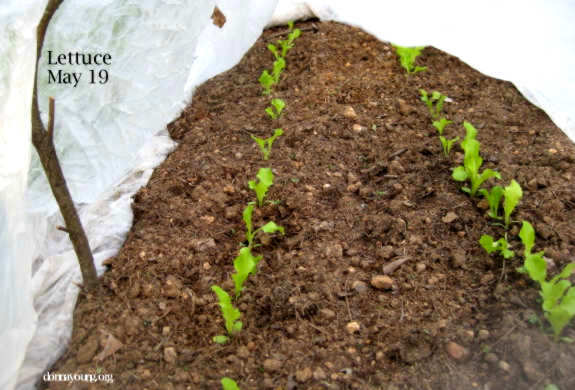 This image shows the lettuce a few days after they germinated. They have the first set of true leaves. The leaves have raindrops in this image. The floating row cover allows rain to pass through. The plants seem to be growing well enough and if they do not bolt, then we will have some nice lettuce to eat in a couple of weeks. 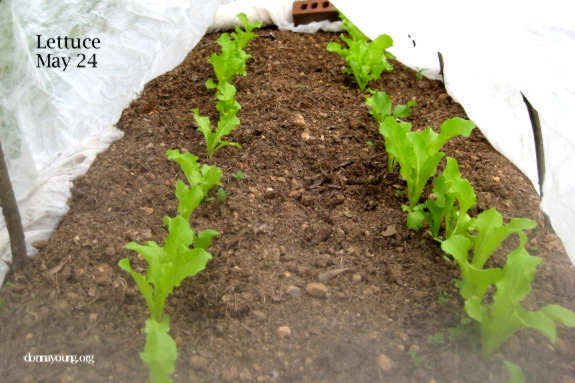 The lettuce seems to be bug-free and healthy and that's what this is all about - bug-free, pesticide-free lettuce. 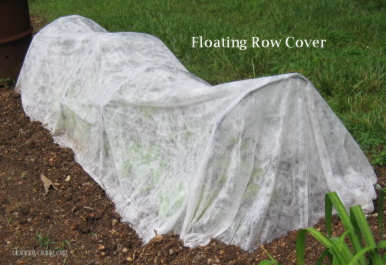 Note: Use floating row covers on plants that do not require pollination.